An app that uses satellite imagery to give flight travellers an interactive, bird’s-eye view of their routes took the top prize at this year’s Space App Camp at ESA’s centre in Frascati, Italy. In its sixth year, the App Camp offers access to the latest space data to app developers, who work to make the information accessible to a broad audience. 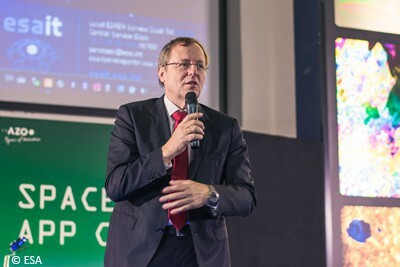 The week-long ‘camp’ culminated today with presentations of the six projects to a jury, including a brief address by ESA Director General Jan Woerner, who discussed the importance of ESA’s space activities for society. “We are developing spacecraft and launching spacecraft […] but at the end of the day all of this is for the people on Earth,” he said. 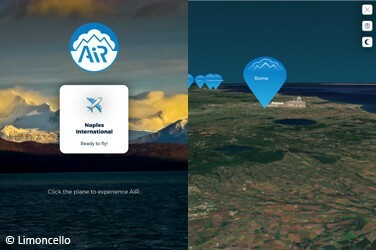 The winning AiR app displays an interactive projection of the world’s surface to airborne travellers from Copernicus Sentinel satellite imagery, letting them see information about the cities and landmarks they pass over during their flight, without the disruptions of clouds or the plane getting in the way. The winning mobile application also made use of the tools developed during the H2020 project Copernicus App Lab. Twenty-four developers from 14 countries attended this year’s App Camp. Other apps developed included Puddle, which combines measurements on aerosol concentration from satellites and ground instruments to present the probability of severe rainstorms in a user-friendly map to help secure assets, manage risks and share accurate information when heavy rain occurs. For mountain bikers, RideGreen combines satellite data such as information on vegetation from Sentinel-2 and air quality data from Sentinel-5P along with in-situ meteorological data to calculate and compare the greenness and cleanliness of biking routes. Also for fitness enthusiasts, Track Champ combines Earth observation data with street maps to find the perfect time and place to stay active while tracking personal performance over time. CARDpernicus is an educational card game that presents Earth-observation data in a beginner-friendly format. The Spottitt app enables corporations to monitor their projects remotely and receive alerts when deforestation limits are exceeded. Users can also monitor areas of interest and even flag deforestation cases by sending photos through the App.